I’ve been following designer/maker Rupert Blanchard’s work since first seeing a cabinet of his at Elemental in London. Rupert spends many of his days salvaging hundreds of drawers, doors, fittings and fixtures from second-hand furniture dealers, car boot sellers, market stall holders and waste clearance companies, before finding the right combination to construct a new piece of furniture. He works and lives in his London studio – originally part of the Shoreditch Police Station, and more recently a furniture factory. What I like particularly is the warm way that he describes the items that he finds and makes new homes for.. I can relate in some small way to his collecting obsession. In my second year at art college I found myself filling an entire old wardrobe shelf with old matchboxes, just because I liked how they looked, and thought I may use them some day. I’ve collected old bike chains, cogs, and rusty metal in the same way. But Rupert takes it to a whole new level..and makes such new beauty from these old things. Where does a person store over 300 cardboard boxes?? Apart from simply loving the look, and admiring the artful way that Rupert has reconstructed each piece, the whole idea completely appeals to my romantic and nostalgic tendencies. It’s impossible not to let your mind run about when looking at these collections. Where have those drawers been, touched by whose hands? What made that mark, that scratch? Every drawer and tiny lock has its own story to tell. They are like little lost children, found a new home, and given a long hot bath and a new pair of shoes. The colours and shapes are well chosen too. I love the contrast between the handles here – flat and thin, soft and round, and the long, lippy ones – mouths with an overbite. You get the feeling that this is a very considered collection, but it doesn’t feel too precious either. I’d love to see this kind of approach used on a larger scale, in a kitchen design for example. 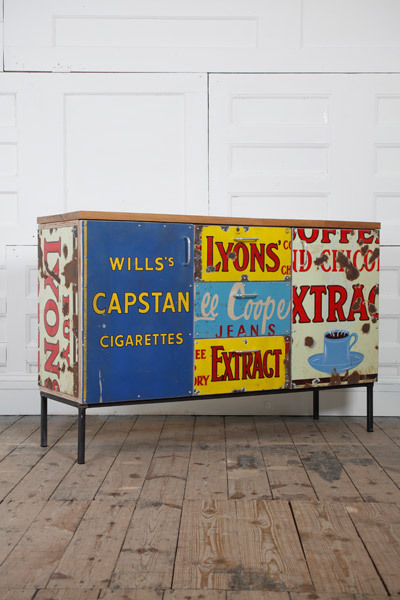 Here Rupert makes use of vintage enamelled advertising signs, damaged and no longer appealing to collectors. I think of the streets these signs graced; the lives passing them by, the designs giving hints of their era. On the top sit reclaimed school laboratory work tops, refinished but still visibly used. Quietly holding a stolen moment in history. Who knows which bored or inspired student has leaned their arms on top of them, with their test tubes and bottles of acid..it could even have been me or you. You get the feeling that these pieces have a little giggle to themselves every now and then when no-one is looking. I can see why Rupert is compelled to make these things sing again.